“Wow!” Ana said. “Look at all the stars.” Everyone in Ana’s family looked up from the campfire. It seemed like there were millions of stars in the dark sky. “Let’s each name one of our favorite things that Heavenly Father has created for us,” Dad suggested. Ana didn’t know what to choose. She thought about the warm sun, the bright moon, and sweet-smelling flowers. Then she remembered how much she loved all kinds of soft, furry animals. “Animals!” she said. Ana started to shiver, so Dad wrapped a blanket around her. “After Heavenly Father created all these beautiful things for His children, He saw that they were good,” Dad said. Ana had a warm, happy feeling inside. She pulled the blanket up to her chin and looked back up at the stars. “Thank you, Heavenly Father,” she whispered. You could give each family member a paper sack and invite the family to go outside and collect three things that Heavenly Father created. Or you could draw pictures or make a list of Heavenly Father’s creations. Then talk about how those and other creations show Heavenly Father’s love for us. 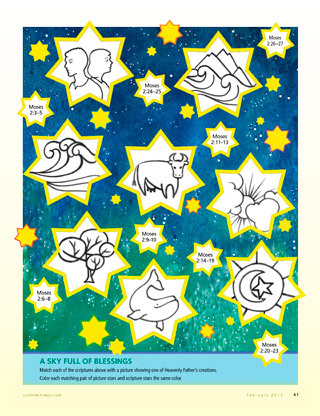 You could take turns reading aloud the scripture verses on each of the stars and finding the matching stars. Match each of the scriptures above with a picture showing one of Heavenly Father’s creations. Color each matching pair of picture stars and scripture stars the same color.